(Buck et al. 2011; OECD 2018). Due to the thermal and chemical stability as well as the hydro- and oleophobicity of the perfluoroalkyl moiety, many PFASs have been and still are used as highly effective and efficient surfactants or surface protectors in a wide range of industrial and consumer applications, such as automotive, food-contact materials, textiles, fire-fighting foams, pesticides, cosmetics, construction products, electronic products, and metal plating (Banks et al. 1994; Buck et al. 2011; Kissa 2001). The large-scale production of many PFASs started between the 1940s and 1970s and increased thereafter, with the global annual production of some PFASs reaching hundreds of tonnes or greater (Prevedouros et al. 2006; Wang et al. 2014b, 2014a, 2017b). In contrast, studies on the exposure and effects of PFASs in the public domain were scarce until 2001 when global presence of perfluorooctanesulfonic acid (PFOS) in wildlife were reported (Giesy and Kannan 2001), and PFASs were widely discovered in human blood samples (Hansen et al. 2001). These revelations led to an exponential increase in research on PFASs. New knowledge has resulted in a general recognition of so-called “long-chain” PFASs (i.e., perfluoroalkylcarboxylic acids (PFCAs) with ≥7 perfluorinated carbons, perfluoroalkanesulfonic acids (PFSAs) with ≥6 perfluorinated carbons, and their precursors) as contaminants of emerging global concern. 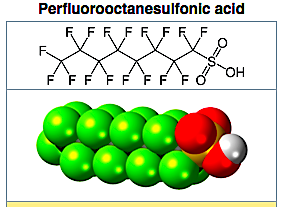 Consequently, due to their persistence (P), bioaccumulation potential (B), toxicity (T), and long-range transport potential, PFOS and perfluorooctanesulfonyl fluoride (POSF) have been listed since 2009 under the Stockholm Convention on Persistent Organic Pollutants for a global restriction, and perfluorooctanoic acid (PFOA), perfluorohexanesulfonic acid (PFHxS), and their precursors are being evaluated for listing (BRS Secretariat 2017, 2018). However, in addition to long-chain PFASs, there are still many other overlooked, structurally similar PFASs on the market, including short-chain and other novel PFASs that have been developed to replace long-chain PFASs. A recent effort has shown that over 4,600 CAS Registry Numbers are associated with PFASs that may have been on the global market, including many that have at least one perfluoroalkyl moiety but were not commonly recognized as PFASs previously (OECD 2018). For many of the PFASs other than PFCAs, PFSAs, and their major precursors, public information on their hazardous properties, environmental fate and transport, exposure, and toxic effects is still very limited, and in the public domain they remain largely unassessed and unregulated (Wang et al. 2015, 2016, 2017c). Recent research into such overlooked PFASs (Fromme et al. 2017; Gomis et al. 2018, 2015; Shi et al. 2016; Sun et al. 2016; Wang et al. 2017a, 2015, 2016), in addition to lessons learned from long-chain PFASs (Cousins et al. 2016; Land et al. 2018; Scheringer et al. 2014; Wang et al. 2017b), shows that at least some of the overlooked PFASs may also be contaminants of emerging global concern due to their high persistence and environmental mobility, modes of action similar to those of long-chain PFASs, wide presence in products, and poor removability from drinking water and contaminated sites. Hence, a growing number of scientists, regulators, and civil society organizations are increasingly calling for effective and efficient assessment and management of overlooked PFASs (Blum et al. 2015; Borg et al. 2017; Brendel et al. 2018; Scheringer et al. 2014; UBA 2016; Wang et al. 2013, 2015, 2017c). In response to these considerations and to strengthen the dialogue and foster cooperative actions between science and policy toward coordinated global efforts to further address PFASs, a two-day workshop was held in Zürich, Switzerland, on 9–10 November 2017. The workshop engaged over 50 academic scientists and regulators (including government scientists) from across the globe. Building on a thought-starter document (SETG 2017), workshop participants focused on a) current needs, b) common goals, and c) cooperative actions to address PFASs over the next 5–10 y, as well as on d) cooperative strategies and actions for maintaining and further strengthening the science–policy interface in the field of PFASs. From the discussions, the following statements and recommendations emerged. These statements and recommendations represent the views of the workshop participants and not necessarily the views or official policies of their organizations and/or governments. It is intended that the results of this workshop will be of use for further development of science and policy on PFASs. Given the vast number and diversity of unregulated PFASs on the market and in the environment, the participants unanimously agreed that further research and management of PFASs require a coordinated approach in order to avoid duplication of efforts and to ensure efficient use of resources. The coordination could start from using the same terminology (including clear identifiers for substances in the PFAS family) for communication between stakeholders. Furthermore, currently available knowledge on PFASs needs to be structured and made more easily accessible to the scientific and regulatory communities, e.g., through a centralized repository. In addition, many participants voiced a need for a mechanism to identify priorities for further coordinated efforts related to PFASs, particularly regarding which PFASs should primarily be the focus of scientific and regulatory efforts and which scientific data should be generated to inform these efforts. Given the large number of substances in the PFAS family, the participants agreed that actions need to address groups of PFASs rather than individual chemicals and that such a grouping approach needs to be scientifically sound. Many participants shared the view that a grouping approach requires a better mechanistic understanding of the physicochemical and toxicological properties of PFASs as well as additional data that can be used to support grouping approaches for PFASs. The participants widely agreed that the high persistence of PFASs in the environment may not be adequately reflected in current chemical assessment and management schemes. The participants recognized the usefulness of current schemes that may trigger management actions on chemicals based on their persistent, bioaccumulative, and toxic (PBT) properties (and very persistent and very bioaccumulative properties in some jurisdictions). However, high persistence can lead to a continuous and nearly irreversible accumulation of PFASs in the environment and, in turn, increased exposure and risks to humans and wildlife, even when some PFASs do not meet the current definitions of bioaccumulative substances used by the regulatory community. Hence, a strong consensus emerged among many of the participants to call for further development of current regulatory schemes to especially account for high (or very high) persistence in the environment. The participants unanimously agreed that despite extensive research in the last 15 y, substantial gaps in scientific knowledge remain for many PFASs, with three specific needs identified: a) further data on toxic effects, including a mechanistic understanding thereof and data on long-term health effects; b) continued monitoring in environmental media and human tissues to identify emerging PFASs and determine the effectiveness of regulations; and c) development of analytical methods, including standardized methods for assessing PFASs in products and media in addition to environmental matrices. In addition, multiple participants also mentioned needs for further information on specific topics such as chemical identity, uses, alternatives, and current and future production and emission sites of PFASs, as well as further efforts specifically regarding polymeric PFASs (including development of analytical methods and information on transformation pathways). Several regulators highlighted that the range of possible research questions may go beyond what would be needed if the precautionary principle is applied and that there is a need to balance research efforts and the implementation of the precautionary principle. The precautionary principle states that where there are threats of serious or irreversible damage, lack of full scientific certainty shall not be used as a reason for postponing cost-effective measures to prevent environmental degradation (UnitedNations Conference on Environment and Development 1992). PFAS hazards and risks to support regulatory action. Most of the participants agreed that cooperative actions should address a wide range of PFASs, including not only long-chain PFCAs, PFSAs and their precursors, but also their shorter-chain homologues, other perfluoroalkyl acids (PFAAs) and precursors, fluoropolymers, perfluoropolyethers, and other newly identified PFASs such as side-chain fluorinated aromatics listed by the OECD (2018). Several participants voiced their reservations and emphasized that such a wide chemical scope may need to be implemented in a stepwise manner; in particular, developing and transition countries could first focus on meeting their obligations under the Stockholm Convention in the foreseeable future, whereas more-developed countries could already start to address those PFASs that are beyond current international and national regulations. In addition, several participants stated that cooperative actions may need to be tailored to specific groups of PFASs. Following discussions on the need for novel schemes to place specific focus on persistence (see above), the participants widely agreed that a common goal of cooperative actions between the scientific and regulatory communities is to explore new approaches to assessing and managing highly persistent chemicals, including PFASs. Some participants further suggested that such new approaches could encompass the development of new criteria that explicitly consider the special aspects related to the very high persistence, in addition to the existing PBT criteria (and also criteria for very persistent and very bioaccumulative chemicals in some jurisdictions). Furthermore, the participants widely agreed that socioeconomic analyses on the uses of PFASs and their alternatives need to be conducted, and some participants further voiced that such socioeconomic analyses need to reflect the long-term societal costs associated with the very high persistence of many PFASs. In parallel to exploring new approaches to assessing and managing PFASs, the participants widely agreed that collaborative efforts should be made to reduce, and eventually phase out, nonessential uses of PFASs. Given that there is no official or widely agreed-upon definition of essential uses, a first goal would be to define the term “essential use” with respect to the applications of PFASs. Some participants also pointed out that in addition to the engagement of industries, it will be important that academic scientists and regulators are involved in the development of safe alternatives to PFASs, particularly for “essential uses” of PFASs and with respect to the development of a systematic evaluation framework of such alternatives to avoid regrettable substitutions. There was unanimous agreement among the participants that public awareness of PFAS-related issues has played and will continue to play an important role in the field of PFASs. In particular, it was noted that increasing public awareness has led to increased importance of PFASs on many political agendas and actions on PFAS-related issues. The participants agreed that cooperative actions should be taken to further strengthen the awareness of PFAS-related issues among policy-makers and the general public, including further empowerment of consumers, product manufacturers, and retailers in making informed decisions. Building on the identified needs and goals, the participants recommended a first set of key cooperative actions in the following areas that may be jointly pursued by the scientific and regulatory communities over the next 5–10 y. Through continuous monitoring and evaluation of progress made in carrying out these actions, further cooperative actions could be initiated and are subject to further dialog between the scientific and regulatory communities, as well as with other stakeholders. In particular, future cooperative actions may focus on information availability and accessibility with regard to: a) substance identities and compositions in products, including polymeric PFASs; b) production, use, and disposal volumes of individual PFASs; c) experimental data on physicochemical properties; d) toxic effects of individual PFASs, in particular the so-far-overlooked PFASs, including a mechanistic understanding of their toxicokinetics and toxicodynamics and of their effects in humans and on the ecosystem level; and e) the life cycle of polymeric PFASs. With regard to PFAS analytics, future cooperative actions may focus on the following areas: a) increasing availability and accessibility of analytical standards and certified standard reference materials; b) continuously developing and improving targeted analytical methods, including approaches that reduce the costs and complexity of analytical methods; and c) developing adequate PFAS databases to support and foster nontarget and suspect screening analyses and workflows. Instead of assessing individual PFASs one by one (and in some cases repeatedly), future cooperative actions may focus on joint assessments for groups of PFASs. These joint assessments may range from hazard assessments (e.g., screening-level assessment of certain hazardous properties as a basis for grouping) to socioeconomic impact assessments of the life cycle of PFASs with a specific focus also on the end-of-life stages of the chemicals. In addition to continuous exploration of safer alternatives to PFASs (including nonchemical alternatives), future cooperative actions may also focus on the following areas to foster transitions to alternatives to PFASs: a) continuous development of alternative assessment frameworks tailored to the specifics of PFASs; b) development of guidance for transition processes from PFASs to safer alternatives; and c) promotion of funding in the cross-cutting research area of “safe-by-design” and alternatives to PFASs. In addition, an overview of exemplary success stories and case studies on the implementation of alternatives to PFASs could be developed. To promote public awareness and participation in PFAS-related issues, future cooperative actions may also focus on exploring existing mechanisms and developing new mechanisms that would allow consumers and other stakeholders to track PFAS content in goods and products throughout value chains, for example, by labelling products with respect to their PFAS content or by developing a “PFAS footprint” for companies. There was unanimous agreement among the participants that to adequately address PFASs, a strong science-policy interface is required. However, participants from the scientific community noted that needs of the regulatory community are often not obvious for the scientific community and may also differ considerably across regulatory frameworks; this circumstance may exacerbate the challenge of setting research priorities in the highly complex field of PFASs. In turn, regulators voiced difficulties in keeping track of the constant flow of new findings and staying up to date with the latest knowledge. All participants, therefore, agreed that the promotion and facilitation of effective communication between the two communities are of great importance to strengthen the science-policy interface in the field of PFASs. The mandate of the Global PFC Group hosted by the Organisation for Economic Co-operation and Development (OECD) and United Nations Environment Programme (UN Environment) could be extended to promote, facilitate, and foster further international coordination under its umbrella. Such coordination could start from expanding the current common terminology to include issues such as the classification of polymeric PFASs. Existing forums and events such as the UN Strategic Approach to International Chemicals Management (SAICM), including regional meetings, could be used to actively transfer knowledge about PFASs to developing and transition countries and to facilitate the science-policy dialog. Innovative and effective knowledge management could be established in the field of PFASs by, for example, developing a global web-based knowledge base as a centralized depository of available scientific, technical, and policy-related information on PFASs. The participants agreed that such a knowledge base would need to be carefully designed and maintained, with careful consideration of both the technical and financial requirements. A network of scientists and policymakers specifically dedicated to the discussion of PFASs could be established. Synergies with other initiatives [e.g., the Network for Industrially Contaminated Land in Europe (NICOLE) and the Interstate Technology and Regulatory Council (ITRC) in the United States] could be explored. In particular, the participants welcomed and agreed that bilateral workshops between academic scientists and regulators are a valuable addition to the existing multistakeholder dialog and should be repeated in the future. Furthermore, several participants recommended that regulators may need to proactively identify and communicate which information would be needed to justify their actions with the precautionary principle in mind. Correspondingly, there was also a general agreement among the participants that the scientific community may need to have their research better communicated, not only to regulators, but also to the wider society, including developing and transition countries. The Swiss Federal Office for the Environment (FOEN) is gratefully acknowledged for the financial support of the workshop and to the preparation of this statement. Konrad Hungerbühler, head of the Safety and Environmental Technology Group at ETH Zürich, is gratefully acknowledged for supporting the workshop. Gretta Goldenman is acknowledged for her support during the workshop. The following individuals are acknowledged for their contributions to the discussions during the workshop and the development of this statement: A. Calafat, Centers for Disease Control and Prevention, Atlanta, Georgia, USA; P. FitzGerald, Safety and Environmental Technology Group, Institute for Chemical and Bioengineering, ETH Zürich, Zürich, Switzerland; W. Gebbink, RIKILT, Wageningen University and Research, Wageningen, Netherlands; K. B. Gützkow, Department of Molecular Biology, Norwegian Institute of Public Health, Oslo, Norway; I. Hauzenberger, Department of Chemicals and Biocides, Environment Agency Austria, Vienna, Austria; A. Heggelund, Norwegian Environment Agency, Trondheim, Norway; H. Joerss, Institute of Coastal Research, Helmholtz-Zentrum Geesthacht, Geesthacht, Germany; A. Kärrman, School of Science and Technology, Örebro University, Örebro, Sweden; J. Kurias, Ecological Assessment Division, Environment and Climate Change Canada, Ottawa, Canada; A. Lai, Safety and Environmental Technology Group, Institute for Chemical and Bioengineering, ETH Zürich, Zürich, Switzerland; S. Posner, Swerea IVF, Mölndal, Sweden; J. Tremp, Industrial Chemicals Section, Federal Office for the Environment (FOEN), Bern, Switzerland; T. Winther, Danish Environmental Protection Agency, Copenhagen, Denmark. These statements and recommendations represent the consensus views of the authors and contributors and not necessarily the views or official policies of individual authors, their organizations, and/or governments.